Ten years ago, TriMet opened the MAX Yellow Line on May 1, 2004. During the past decade, nearly 46 million trips have been taken on the line, while the area has grown with new housing developments and businesses. 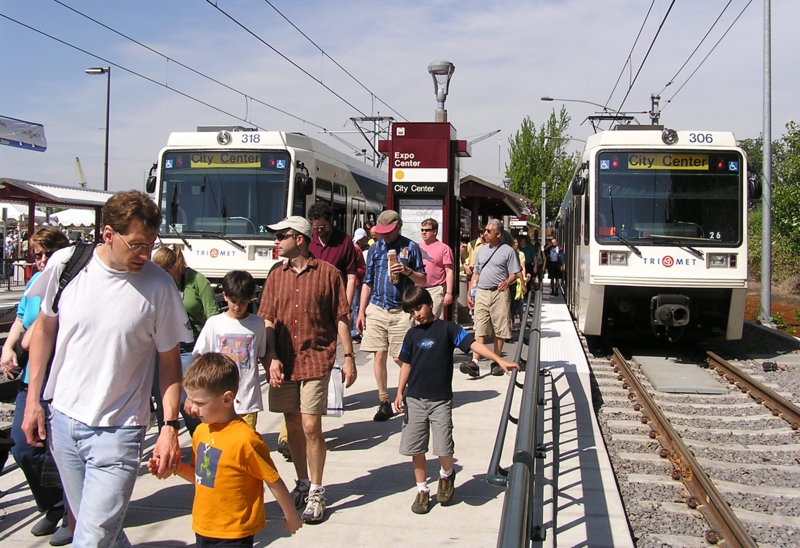 Opening day on the Yellow Line on May 1, 2004 attracted thousands of riders. Annual ridership has grown 24.2 percent since 2004. Opening year ridership totaled 3.9 million trips and now tops 4.9 million trips. Weekday ridership has grown 30 percent since opening year, climbing from an averaging 11,600 trips, to 15,100 trips today. Part of the ridership success of the MAX Yellow Line is that it has 3.7 times more capacity over the former line 5 bus line that served Interstate Avenue. The Yellow Line brought high-capacity transit service to the North/Northeast neighborhoods, along with new sidewalks, traffic lanes, bike lanes, art and a more pedestrian-friendly environment. When the Yellow Line opened in 2004, there was a 50 percent increase in the number of new businesses along the avenue, and that number continues to grow. About half a dozen housing developments have opened or are under construction within walking distance to the MAX stations. open was the 54-unit Patton Park that was built on the site of a rundown hotel. 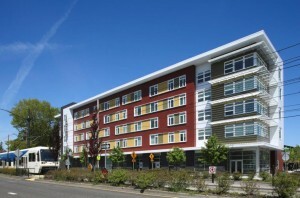 Opened in 2009, it provided the first large-scale affordable housing along Interstate Avenue that included a dozen family-sized units with three bedrooms. The building also houses a bi-lingual day care facility on the ground level. 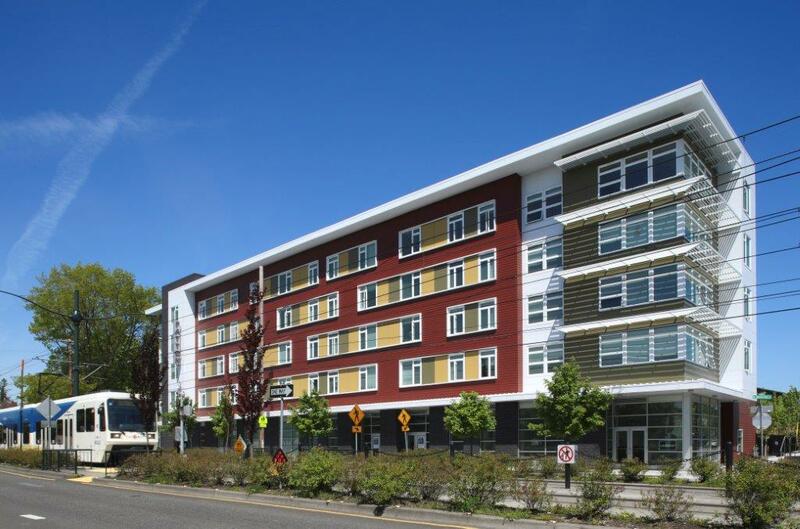 With a focus to bring displaced North/Northeast residents back to the community, qualified first-time buyers for the 57-unit Killingsworth Station condominium project were eligible for down payment assistant through the Portland Housing Bureau’s Down Payment Assistance Loan program. The housing bureau partnered with the Minority Homeownership Assistance Collaborative to identify and select eligible households to receive these loans. Esmeralda Caldera bought a shop and opened her Exodus Spa and Salon before Yellow Line construction began. Anticipating a big upswing in business near the N. Prescott Station, Caldera began a major renovation in 2004. She feared she had over-invested and struggled financially for years. Meanwhile, MAX was beginning to deliver customers. “I still pick up recurring appointments from customers who first learned about me from the window of MAX,” she said. Fire on the Mountain next door also produces clients. Her diverse customer base is loyal and committed. Since the decision to build the first MAX line in 1980, there has been more than $11.5 billion in development within walking distance of the MAX stations. Light rail is a proven catalyst for development. TriMet committed to having the Yellow Line be built by people and businesses from nearby communities. 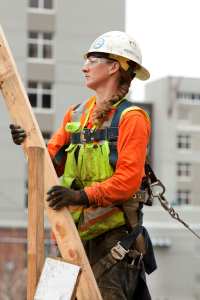 By eliminating barriers for small businesses, often minority- or women-owned, TriMet created a national model of inclusion for Disadvantaged Business Enterprises (DBE) firms who previously have been unable to compete for large construction contracts. DBE firms secured 18 percent or $35 million of Yellow Line contract dollars. Fast forward to the Portland-Milwaukie Light Rail Transit Project now under construction where a record 127 DBE firms have worked on the project, totaling $154 million in contracts. “It’s been so gratifying to see how we’ve helped these small firms grow their business, expand into new areas and create family-wage jobs for others,” said McFarlane. The MAX Yellow line opened four months ahead of schedule and about $25 million under budget. It expanded the MAX system to 44 miles with 64 stations. Since the Yellow Line opened in May 2004, the MAX system has expanded to 52 miles and 87 stations serving all three counties in our region. The MAX Green Line opened in 2009, and the region’s sixth MAX construction project, the Portland-Milwaukie Light Rail Transit Project will open on Saturday, Sept. 12, 2015 bringing the MAX system to 60 miles and 97 stations.